There are few companies in cycling that have created such a strong brand image as Rapha. Since starting up just three years ago, the London-based company has emerged as one of the foremost names at the premium end of the cycling clothing and accessories market. But for some cyclists, Rapha is a rip-off. They think the hefty price tags,nostalgically-stylised designs and fancy cultural indulgences detract from cycling?s purity. For others, though, the company has injected a much-needed breath of fresh air into what Rapha perceived as a largely passive, passionless and unsophisticated road cycling industry. Alongside producing high-quality clothes, luggage, skincare products and a number of publications, Rapha has been involved in the promotion of several colourful events. It also sponsors a domestic road race team, which has recently announced it will be merging with Recycling.co.uk for next season. In this Big Interview we speak with co-founder Simon Mottram about the motivations for setting up the company and Rapha?s vision for the future. What made you want to start Rapha? Basically, I?m the target market for Rapha. My passion in life was road cycling and because I was quite successful and had a bit of money to spend, I?d go to my local bike shop in my lunch hour wanting to buy something. But I was always appalled with what was on offer. The bikes were always fantastic ? you could spend a fortune on bits of metal ? but when it came to clothing, the styling wasn?t great, the fabrics were fairly basic and the whole way it was presented was a bit of a mess. It frustrated me. I enjoy wearing the kit and riding my bike, but a lot of the time I felt like a weirdo in this bright yellow skin-tight gear. So you took matters into your own hands? It came into my brain that there was an opportunity here that the industry hadn?t quite woken up to. I thought there must have been more people like me who wanted something of a higher standard. So I spent about five years researching it and brought in a friend of mine, Luke Scheybeler, who?s our creative director. Together we drew up a plan to focus on this new market. Is there an ethos behind the company? Yes. The company is completely passionate about cycling. I knew from my previous work as a marketing consultant that what a lot of people want is a brand that shows it?s got the same passion that the customers have. I think it?s a bit of a shame that in our industry a lot of companies are doing a reasonable job but there are not, as far as I can tell, that many that are really in love with the sport. They do the trade shows and change their range every year, but they?re not out there in the Pyrenees or the Alps, riding the Etape or doing a 100-mile training ride in January. Yes. And we try to show that to our customers in the way we design and present our products. It all comes from us riding our bikes and thinking what could be better. What has been the most important factor in the success of the company? I know it?s a marketing jargon word, but I think people appreciate the authenticity behind the brand. Everything we do comes from a love of that struggle and glory that is at the heart of road riding. Having a team actually takes up far too much of our time and doesn?t deliver that many sales. But we do it because we love the sport. Speaking of the team, how do you feel about a top-end brand like Rapha becoming co-sponsors with what is essentially a scrap metal merchant? I think [Recycling.co.uk boss] Charlie Jackson has done a very good job with branding his business as Recycling ? he?s obviously got a touch for marketing. Seriously, though, I don?t think it matters at all. In our world ? the cycling world ? Recycling is known as a top cycling team. What?s always been really appealing about Recycling is how professional they are. By contrast, we?ve turned up with our team this year in a battered old car and although we?ve got some very good helpers, it?s quite an amateurish set-up. What are the biggest obstacles you?ve overcome in establishing the company? When I started researching within the industry, people said: ?This will never work; cyclists won?t spend the money; they won?t buy online; you can?t develop a range unless you?ve got 20 years of experience.? That set us a challenge to prove them wrong. The other big challenge is getting products made to the right quality and delivered when you want them. We still work with some factories in the UK, and initially we worked with more, but it?s been a real struggle to get the product in our warehouse the day we want to launch it, while still having two sleeves and a zip that doesn?t fall off. When you?re trying to be the best, you can?t afford to have anything go wrong. What?s your vision for the company? We?d like to become the most desirable brand in cycling. We started pretty well but there are some amazing bike brands out there, like Assos. The one thing we should most aspire to is to have an amazing range of products that help our customers to enjoy their road riding; to make the most of the time they?ve got on the bike and make it as rewarding and exciting as possible. The St Raphael team which Jacques Anquetil, Tom Simpson and Brian Robinson all rode for in the 1960s had a feeder team called Rapha. I read about it a few years ago and I thought it had a nice ring to it so I went and registered it as a trademark. Your marketing and designs tap into the history of the sport quite a lot. Yeah they do, but a lot of people call us a retro brand, which I don?t think is really very fair. We?re not just looking back. A lot of our products use high-tech fabrics that nobody else uses. I think in many ways we?re pushing the industry forward. But in terms of styling, the glory years of the sport ? in the ?60s and ?70s ? was just very dramatic. The kit then was a bit simpler, they weren?t going crazy with logos all over the jerseys. They had simple stripes and that appealed to us aesthetically. We?re quite romantic like that. 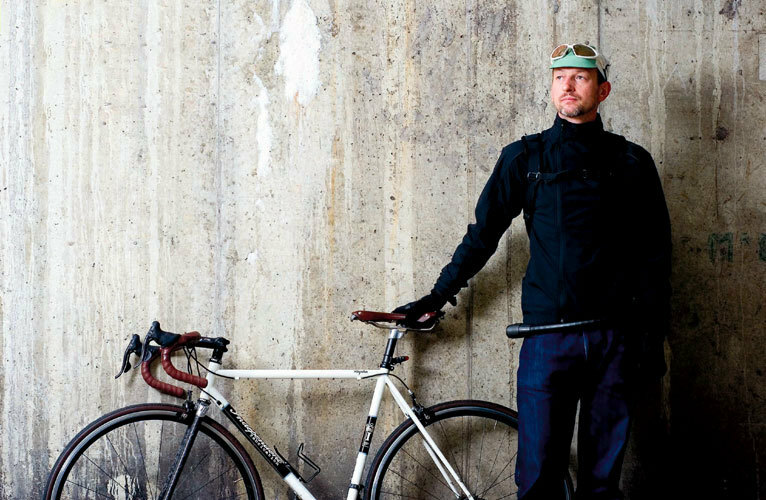 What is your response to people who think that Rapha products are overpriced and for poseurs? If you think they?re overpriced then they?re not for you. We don?t set out to produce the highest-priced product, we set out to produce the product we really want. Take our jerseys, the price of the fabric we use for them is probably five or 10 times that of the fabric that a mass market brand uses. If you look outside of cycling ? at things you?ll find on the high street ? our prices aren?t that high. We?ve just launched a website called Rapha Continental (www.rapha.cc/continental) and that?s just celebrating hard riding. You know, groups of mates going fast, being sociable, riding sportives, whatever. It?s something we all do in the UK and don?t talk about much. This year there were 70-odd sportives in Britain. Nowadays people would rather go and do that than ride a Tuesday night crit. Cycling and the industry is going through a change. This is actually a really good time for what we?re doing.